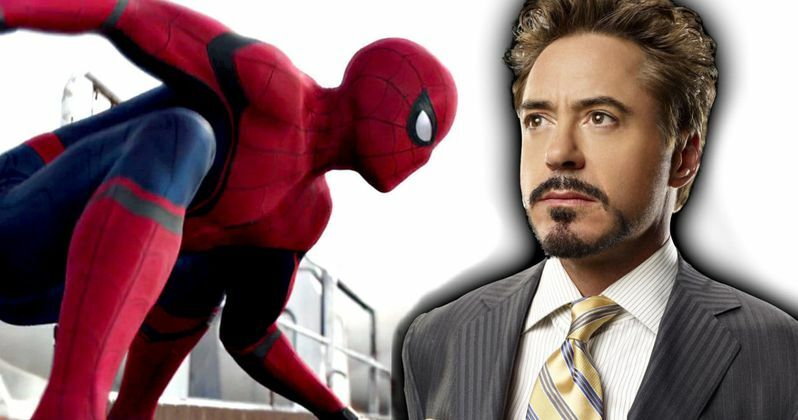 What Is Tony Stark Doing in Spider-Man: Homecoming? We've known for several months that Robert Downey Jr. will return as Tony Stark in Spider-Man: Homecoming, but very little is known about how he will fit into the story. Today we have new photos from the set in Queens, New York, which show Tony Stark's car and some advertisements that reveal this Avenger is gearing up for something huge in the Big Apple. If these photos are accurate, then it seems this movie will feature a new Stark Expo. A Reddit user spotted advertisements for the new Stark Expo in Queens, with this fictional event set to take place between October 17-28, 2018. We don't know exactly if Peter Parker (Tom Holland) will be a guest of Tony Stark at this expo, since Stark essentially served as young Peter's mentor of sorts, recruiting him to join Team Iron Man in this summer's Captain America: Civil War. What's curious is that the Expo is set more than a year after the movie will be released, on July 7, 2017. As you may recall, though, the last time we saw a Stark Expo on the big screen, it didn't exactly go as planned. The Stark Expo was a major part of Marvel Studios' very first sequel, 2010's Iron Man 2, but that party was crashed by the villainous Ivan Vanko (Mickey Rourke) and Justin Hammer (Sam Rockwell). Both Tony and his friend James Rhodes/War Machine (Don Cheadle) managed to save the day and put these villains down for good, but, if recent rumors are true, we may know who will be targeting the Stark Expo this time around. We reported last month that Michael Chernus has signed on to star in Spider-Man: Homecoming, reportedly playing the Marvel villain known as The Tinkerer. There have been rumors that The Tinkerer was a former Stark Industries employee who was personally fired by Tony Stark himself. This reportedly sets him on a nefarious path, and it has been rumored that he helps Adrian Toomes build his Vulture suit. It's possible that Tinkerer and Vulture will target this Stark Expo, but that has yet to be confirmed. We also have a photo and a brief video that shows Tony Stark's vehicle on the set, although we have yet to see Robert Downey Jr. on the set thus far. It hasn't been confirmed how much filming is left on Spider-Man: Homecoming, which has been set for release on July 7, 2017. Take a look at the new photos and videos below, which reveal Tony Stark's presence in this superhero adventure.